The Number Five Donald Business Centre offers an exceptional selection of fully furnished and professionally decorated offices for lease singly or in a block. The Centre’s attractive rate schedule and flexible space and service options make it an especially good choice for businesses on the grow. 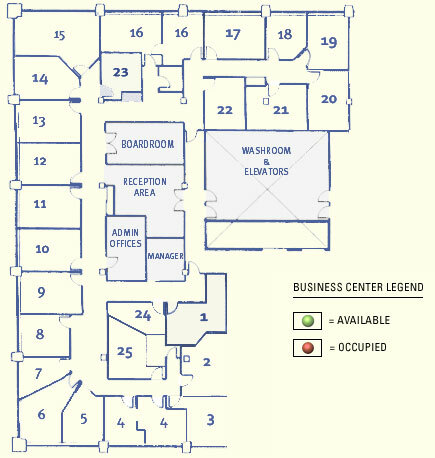 Looking for a larger office space? Then visit the Number Five Donald website for more information on other spaces available in the Five Donald Building. Click the office space of your choice below for more information or browse the list to find available offices. 14. D. J. Martin Holdings Inc./Liquid Capital Corp.
15. Ranch Asset Management Inc.
23. D.J. Martin Holdings Inc.